Homemade bread couldn’t be easier! 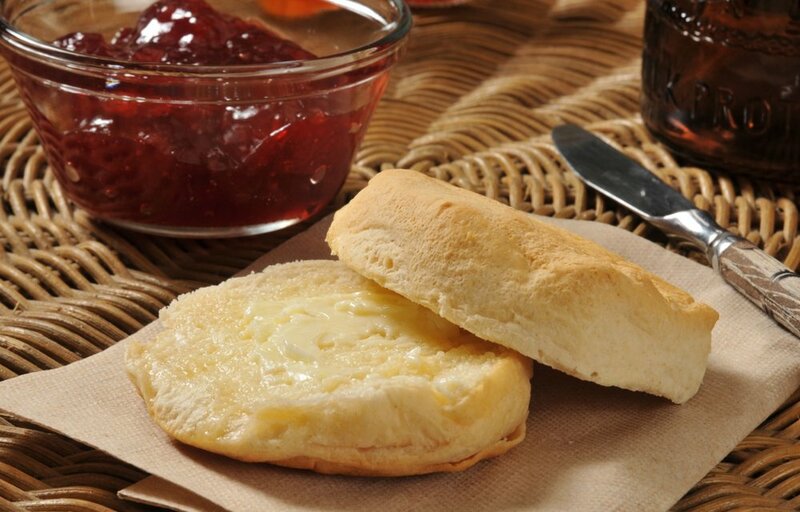 These biscuits don’t require any yeast or proofing time…they don’t even need an oven as they get cooked on a griddle or in a pan! A perfect and classic dish for the early Colonists! OPTIONAL: Feel free to include diced fruit in the dough – Strawberries make an especially sweet, colorful and yummy addition! Combine room temperature butter with sugar – creaming them. Add in flour, salt, baking soda and powder and mix. Slowly drizzle in ice water/milk and combine mixture, forming it into dough. Cut or simply rip small portions of the dough (golf ball size) and by hand, flatten them into small 3-5 inch circular pieces. Prick the surface of the dough with a fork and cook on an oiled hot griddle. Turn with a spatula and remove when golden brown. Watch these flat bread disks closely because they cook fast! Total cook time should be about five minutes. Serve warm with jam, a drizzle of honey or maple syrup as a delicious topping!